I get a knock on my door the other day. My landlord is standing there with branches of bay leaves: “I thought you would enjoy these! I’ve been pruning the tree” he said. What a kind and thoughtful guy! One thing I love about summer cooking is knocking up perfectly simple and quick dishes like this one and the abundance of chilled Sauvignon Blanc, of course! I had some haddock that Chris picked up earlier that morning and thought I’d pair the two. Drizzle the fillets with some more olive oil, sprinkle with salt and pepper, layer with bay leaves, and baked. Cook fish about 7 minutes per inch, measuring at the thickest point. Bake at 350F/180C/4G. Im lovin’ the fresh,quick and simple approach…fits into my busy day! I love any fish that are simply prepared. Nice pics. 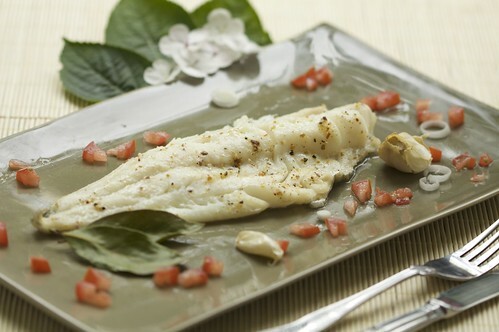 I would love this I am a real fish person and haddock is so delicious – very tasty recipe. Fresh, simple fish dish, combined with a properly chilled Sauvignon Blanc sounds wonderful Beth! Okay, I have been dreaming about this dish in my sleep. Im waiting on Matthew to go diving and catch a great fish to prepare in this method.